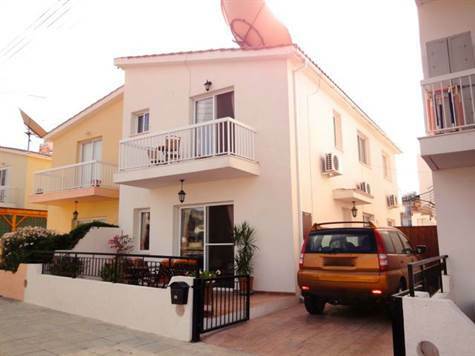 Yeroskipou, Paphos - This spacious 3 bedroom villa is located in the village of Yeroskipou. The many local village amenities are within easy walking distance, and the beach, together with Paphos Town, is a few minute’s drive away. The well planned ground floor accommodation features a comfortable lounge with traditional fireplace, formal dining area, and kitchen/breakfast room. At the base of the marble staircase is a cloakroom and useful storage cupboard. The kitchen/breakfast room is very spacious and well equipped with lots of cupboard and worktop space. A feature glass brick breakfast bar nicely separates this from the formal dining area. Upstairs are three double size bedrooms, all with fitted wardrobes. The master bedroom has an en-suite shower room, and a family bathroom accessed directly from the landing is shared by the second and third bedroom. Both the master and second bedroom has it’s own balcony accessed via patio windows. A fitted cupboard on the landing provides further storage. There is plenty of outdoor space at both the front and rear of the property for BBQ’s and relaxing. Patio windows in the lounge provide easy access to the front veranda, and there is access from the kitchen to the rear. When you fancy cooling down, there is a swimming pool and pool shower for use by the residents of the project. There are full title deeds and the property is ideal as a holiday home or as a permanent residence. The majority of the furniture is included in the asking price.